Pop. 259. 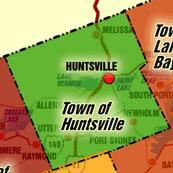 Part ofthe Town of Huntsville, Muskoka Dist. on the S shore of Mary Lake and C. Rds. 10 & 44, 21 km. N of Bracebridge. Pop. 112. In Watt T., Muskoka Dist. on Hwy. 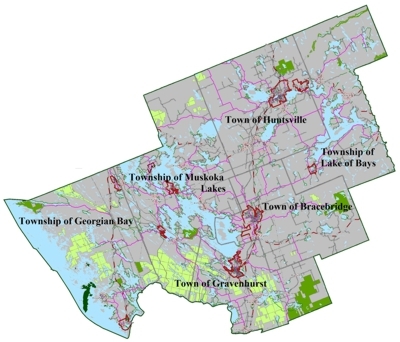 141,21 km NW of Bracebridge. First noted on an 1881 map. Pop. 315. In Lake of Bays T., Dist. Mun. of Musk ok a, at the Send of Lake of Bays and on C. Rds. 2, 51 & 117,20 km. NE of Brace bridge. Pop. 226. In Monck T., Muskoka Dist., on L. Muskoka and Hwy 118, 17 km NW of Bracebridge. Pop. 137. In the Town of Brace bridge in Muskoka Dist. on the South Branch of the Muskoka R. and Hwy. 118, 2 km E of Hwy. 11, 6km S of Bracebridge.